This 1985 Crown Super coach school bus has a 855 Cummins Diesel turbo engine, it also has a 5 speed manual transmission. This is a 77 passenger bus plus a spot for the driver to sit. This is a bigger bus in size. You can use this vehicle for long tours, all kind of outings. The seating for this vehicle is blue and a leather type material. There is side lights above the windows so you can see. The inside of this bus has heating to the rear. It is also equipped with a tachometer that has Revolutions per minute and Miles per hr on it. This 1985 Crown super coach school bus has a 2 stage Farr air cleaning system in it as well, so you can breath in fresh air. There is an anchor lok air drying system. This bus also has two defroster fans so less waiting for the bus to get clear of fog and frosting. 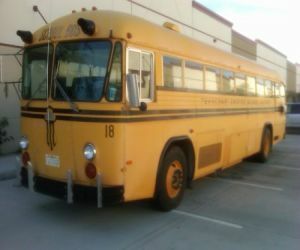 This 1985 Crown Super coach school bus is yellow and black in coloring. The front of the buses windshield is shorter then other buses are. To the front of the bus there is a rack that you can place maybe a bike in. All around this bus there are lights, so people can see when this bus is coming at night. It appears that this school bus has under carriage storage compartments.